FibroDog: Please tell us what type of animal you are, your age, and where you live. My name is Lily. 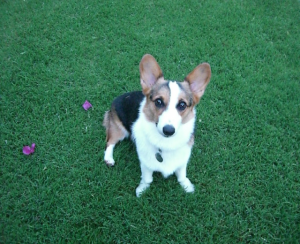 I am a 4 year old tri-color Welsh corgi living in Phoenix, Arizona. 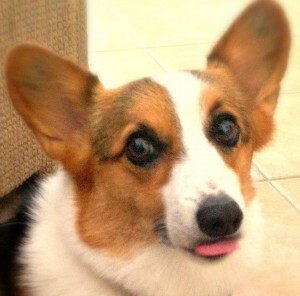 Lily the Fibro Support Dog! FD: Tell us about the human you support: are they male or female? Do you know how old they are? Do they call themselves a name? Like Mom or Dad or Sally or Fred? My Mom’s name is Kristine. She is 48yrs old, I’d like to tell you how old that is in dog years, but I can’t count that high. My Mom is famous because she blogs at A Life Well Red on WordPress. Mom has Fibromyalgia and Myalgic Encephalomyelitis (M.E.). Mostly she spends a lot of time at home with me, and walking around the house very slowly sometimes. We do go out in the backyard a lot though, where Mom watches me run back and forth chasing the birds off my lawn. FD: Wow, I’m not even going to try to pronounce that M.E. thing but it sounds pretty rough. What kinds of things do you do to help your Mom when she’s feeling sore or tired or sad from her fibro or M.E.? When Mom feels especially bad, I give her a hug by nosing underneath her chin and pressing my furry body against her. She also seems to just enjoy watching me play around the yard, and nibble the ears off my stuffed dragon. She says it’s calming, but I think she’d feel better with a chew bone of her own to gnaw on. FD: Your furry hugs sound awesome, I’ll bet they help your Mom a lot! What kinds of things do you try to avoid doing so your Mom doesn’t feel worse? (I know I accidentally broke my human Mom’s nose once when I was trying to give her a kiss, and that seemed to make her feel even worse for some reason, so I’m extra careful with kisses now). Are there things you have to be careful with so you don’t accidentally make her feel worse? Like not pawing at her too hard or not going potty in the living room when she’s having a bad day? I’m only about 16 lbs, so I don’t hurt her too much when I perch on her leg to get a better view out the front window. My legs are pretty stubby too, so I can only get so high when I stand up to jump on her and say hi. I also try to be extra obedient on her ‘bad’ days and come inside the first three times I’m called instead of the usual seven. FD: Wow, I’m impressed Lily, coming inside the first three times you’re called takes some serious commitment! I think I’ve got a ways to go in that department, but what I’m lacking in obedience I make up for in Snout. (At least that’s what Mom and Dad say all the time!) Is there anything else you or Kristine would like to say to our FibroFans out there about what they can do to be a more supportive friend? The best thing I do for my human is be myself and give her all the furry love that’s in me! Yeah, I’m pretty awesome like that! FibroDog p.s. – Special thanks to our human Moms Medea and Kristine for typing out our interview, because in case folks haven’t noticed, paws aren’t great for typing. I hope everyone enjoys reading my first interview, and if any other fibro support critters out there would like to be interviewed and join Lily and I in our Fibro Posse please leave your info below, or email my human Mom and Dad at fnpmedeakarr@gmail.com. And please check out Lily’s Mom’s blog A Life Well Red – once you read it it you’ll probably want to follow it. That’s what my Mom did. What a great interview! 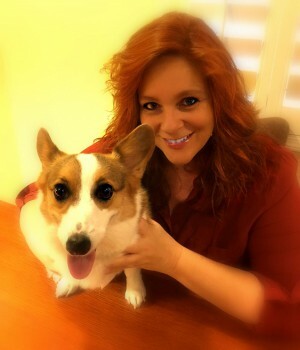 Thank you Fibro Dog and Lily for all the wonderful things you do to help your humans feel better with their conditions! Way to go!!!! Jasper is next, let us know when he’s ready for his FibroDog interview! Ghost the siamese cat would love to be interviewed! Love this blog. Ghost the siamese cat would love to be interviewed. Love the blog. Wow Lily! Thank you FibroDog, This is Isis, I am my mom’s FibroKitty. Thank you Moms Kristine & Madea for a wonderful and insightful interview. Very few people truly know how much support we in the FibroAnimal Community give our human Moms & Dads. My human mom Sandy & I would love to help you spread the word. We look forward to hearing from you. PS I have a Brother Casper & Sister Mystic, they may love our human mom too. I just happen to be attached to her hip constantly and must know where she is and when she is getting back.